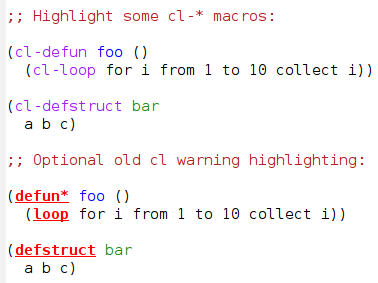 This library adds all of the familiar highlighting to cl-lib macros (cl-defun, cl-loop, etc.) that were originally provided for cl. It&apos;s not simply throwing in all the symbols as keywords. They&apos;re being added using the same regular expressions that cl gets, so function names get highlighted with cl-defun, type names get highlighted with cl-defstruct, etc. Load this library and run cl-lib-highlight-initialize. If you want to mark out the old cl functions with a warning face, also run cl-lib-highlight-warn-cl-initialize. I think cl-lib was a mistake, but since it&apos;s here it needs to be well-supported. The Emacs devs have chosen to exclude cl-lib font-locking so it must be supported through a library.